Stefos was the second waiter I encountered. He came by the table and asked me if anyone would be joining me. I'm getting quite accustomed to saying, "Just me." "You will be eating or just drinking?" Stefos came back after I'd looked at the menu. "You know what you like? Beer, wine? Something else?" "Okay. I have something very nice for you. It is our demi-sweet wine..." Blah, blah, blah. You had me at, "Just drinking." However I will say this. Greece has some badass sweet wine. This wine was not as full-on sweet as the wine in Santorini, but delicious nonetheless. The music was delightfully Greek without being too cheesy. And then a few of the guys in the restaurant started doing traditional Greek dancing in a row, arms interlocked. And who caught my eye with the dancing? Friggin Stefos. Many smiles, many glances exchanged. If you haven't realized by this point, this is going to be an extremely girl post about a young woman abroad and a mysterious, foreign man. "I thought you might need some water," he said, dropping off a liter and a half of water. That's a lot of water. "So you brought me all the water? Thank you." My dry American humor does not always translate. I ordered a second glass of wine. And when it arrived, what else arrived? "Here. And this is for you," said Stefos. I have to stop again briefly. Because what I'm about to tell you is completely true. And I'm disappointed that I've made it 32 years into my life without having such a gesture happen until this point. I looked down at the table and there was a folded, rolled up piece of yellow paper on the tablecloth next to my glass. I looked up and Stefos and I locked eyes. When a boy passes you a note (not that this has ever happened to me and not that I know at all), you want to make sure he doesn't see you read it because there's a 110% chance that you'll end up with a dumbass grin the size of Texas across your face when you read it. And I was trying to play it cooool. I don't know if he saw me read it or not, but I like to pretend that I maintained my super relaxed persona. Yep. "Amigos Bar 11:15p.m. OK?" Let's pause to consider the silliness of having a Spanish named restaurant smack dab in the middle of Greece. When he walked by my table again, I gave him a big smile and a nod. He gave me a sly grin and subtle nod. How in the world does this stuff happen? This never happens! I'm about to generalize on American men. There seems to be a lack of spontaneous romance/chivalry/flattery. I've never had someone write me a note. Beyond that, I've never actually met a guy in a bar. I don't know what it is. Maybe I'm just too beautiful to be approached. Yeah, that has to be it. 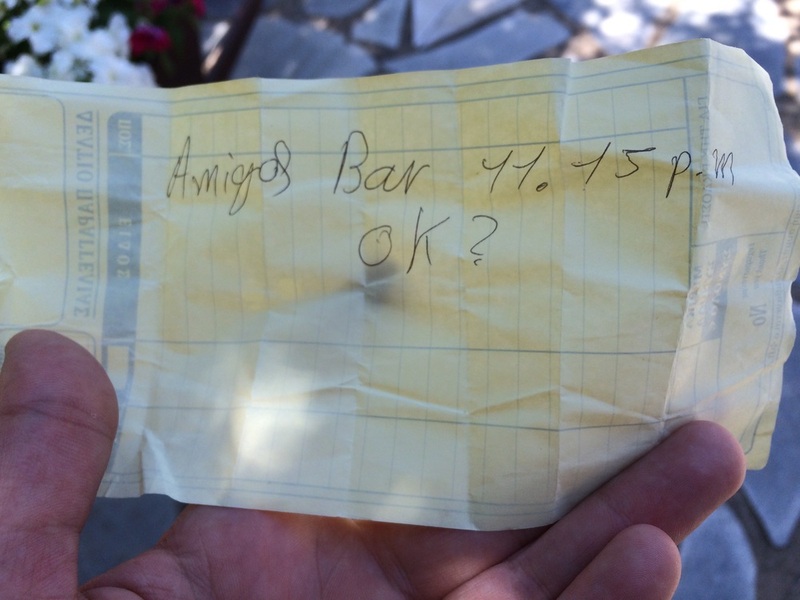 But seriously, writing a girl a note in a bar/restaurant is something I've only seen in movies. Which is probably where he got the idea in the first place. The note was dropped around 10pm, so I only had an hour to collect myself. I decided to hit the road because I didn't want to wait around and walk out with him. That's just tacky. I paid my bill and got up to leave. "We'll meet there, yes?" he said covertly. "Yes. It's that way, right?" I said pointing in the general direction I think I'd seen the bar earlier. Went back to my hotel. And realized that the bar was directly across the street from my hotel. So what does a girl do when she's about to meet up with a cute boy? She immediately starts texting her girlfriends. I received some good advice including, but not limited to 1) Don't let him drug you and 2) bring a knife. Thanks, girlfriends, you're actually the best. As I was leaving the hotel again, the owner, who was the super nice man from earlier who gave me the mountain view, said, "If you are going to be out past 1am, I must give you a key to the front door. That is when I lock up." So the man gave me a key to the hotel. And I felt like he was my dad finally telling me that I no longer have to abide by a curfew. I walked across the street and in. Stefos was sitting at the bar. "Hi," I said. "My name is Sara, by the way. What's your name?" "I am Stefos. It's like Steve. My whole name is Stefanos, Steven. You can call me Steve or Stefos." He was drinking some kind of lemon infused beer so I ordered the same. No, he did not drug me. I would liken Stefos to a younger Daniel Craig, but Greeker. He has blue eyes, light brown hair and a smile that makes me melt. (Too girly? Don't care.) Stefos also wears a gold chain. Now, I'll stop you right there. I also have thoughts on men who wear gold chains. But, in the states, I think it's gross. Here, it seems standard. He also wore a leather cross necklace of sorts. Jeans, t-shirt, sneakers. We talked. His favorite movie is The Last Samurai staring Tom Cruise. Or The Rock, which I freaked out about because that's one of those movies I can watch over and over and over again and never get sick of it. He also loves all the Bourne movies, except for the fourth one. That one was no good. He was pleasantly surprised to hear that there is a new one coming out staring Matt Damon. Stefos was born in Athens, but dislikes the city. Apparently outside of all the parts I went to, the city is rundown and not an enjoyable place to be. Stefos has two sisters, Maria and Efi. He was surprised to hear my parents are still married because in Greece it is similar to the states in that "everyone" gets divorced. That said, his parents are still together and his mother may or may not have 15 cats. He lives in the town ten minutes outside of Delphi. "I have something I want to show you. Would you like to see the view of the stars from my place?" Uh huh. That's a line if I've ever heard one. "Nevermind. I'll explain it later. Yes, let's go see the stars." Stefos likes a variety of music. He played the expected European techno music, but then also some traditional Greek music followed by American folk. I'd never heard any of it. We got to his place. (Settle down folks. I'm a lady.) He actually does have the most beautiful view of the stars I think I've ever seen. His apartment is, of course, on the side of a hill and he has a very large balcony. There are no city lights and nothing to obstruct the view in all directions, save the mountain. Looking up at the constellations named after the gods made it seem so authentic. A lady never kisses and tells, but if I leave it all out, you're going to come to your own conclusions. Yes, he kissed me. Because you have to kiss when you're under the stars in the mountains of Greece. Okay, enough said. "Would you like to go get a drink in my town?" "Yeah, that sounds good. Can I use your toilet first?" "Uhhh... yes. Ehhh. It is sick. It is a man's bathroom." Yep. Men are kind of gross worldwide. But his bathroom was completely adequate. He took me to his town square. There were restaurants and bars about and we went in to one of them. He, of course, knows all of the staff in this town and likely Delphi. Small towns and all that. "What would you like to drink?" I asked. He bought the first round, so I was going to offer to get this one. That, of course, didn't work out. #chivalry But at least I tried. "I like whisky." I think he just became the man of my dreams. "What would you like?" Now, the whisky arrived. He asked me if I liked it. I did, but this was scotch, not just whisky. Which was fine, but cultural difference noticed. He talked about money and the economy. "Guess how much I make at the restaurant." I guessed. And I grossly overshot it. Thirty Euros a day for 12 hours of work. And Greeks don't really tip. "I worked at the ski area for a season, but the hours are short and working and the pay was no good." I hadn't realized this, but yes, it does snow in Greece and yes, there is skiing. "You see this square? In high season it is packed. Even in winter it is completely full because everyone goes skiing. But not so much now that we are in crisis. In crisis, Greeks don't come out. It is empty." It both did and didn't occur to me that places like this don't just rely on tourism; they rely on the community to support it. "We have the same eyes," he said. "Except yours pop out more than mine." This was not an insult. This was just truth. And yes, he does have blue eyes to match mine. "My eyes are red when I see a man. But when I see a woman, they are blue." I get what he was getting at. "Okay," I said. "Smooth. Smooth means you're being flirty and cool." I should have told him it's like James Bond, but it didn't occur to me. "Like when you passed me the note at the restaurant, that was smooth." He kept holding my hand all night, which was very welcome. It's been a while since I've been on a solid first date. At one point his phone rang. It was the waiter who sat me down at the restaurant hours before. "I am sorry I have to take this. It is about the hours tomorrow." "Okay. Tell him I said hi." He spoke in Greek and I have no idea what he was saying and then he said, "Yes, we are together," looked up at me and smiled. He hung up the phone. "He is jealous I am with you." "Well he didn't act fast enough." I then had to explain what that meant. But really what it sounded like is that I would have gone out with anyone. Oh well. He drove me back to my hotel. We said goodbye. No information was exchanged. I only know his first name and that he has the most beautiful view of the stars I've ever seen.